Franchising provides excellent business opportunities for individuals, companies and investor groups. The number of franchisors, variety of industries and different levels of invesments create business opportunities for the smallest single unit family businesses to the large multi -million investment groups looking to diversify their portfolios. Single Unit Franchise (or Direct Unit Franchise) is the most traditional and historically the most common form of franchising. Franchisor grants to an entity (the franchisee) the right and obligation to establish and operate one franchise. The franchisees have to invest their own capital and apply their own management skills (generally hands-on). 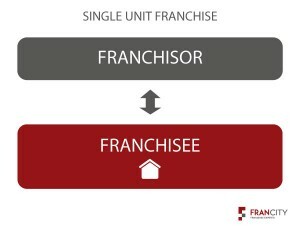 Franchisor grants to an entity (the multi unit franchisee) the right and the obligation to establish and operate more than one franchised unit. The multi unit franchisee agrees up front to open a specific number of locations during a defined period of time. The multi unit franchisee must have the financial and managerial capability to develop multiple units itself. This type of franchising arrangement is similar to the multi unit franchise- the franchisor grants to an entity (the area developer) the right and the obligation to establish and operate more than one franchised unit. The area developer agrees up front to open a specific number of locations during a defined period of time within a defined area. 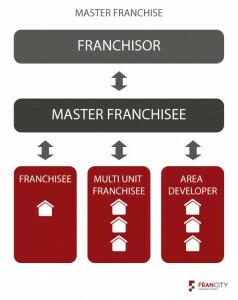 Franchisor grants the right to an entity (the master franchisee) for a specific country, region or continent, empowering the master franchisee to provide the full range of products and services of the franchisor through sub-franchising, in just the same way that the franchisor runs its own business. The master franchisee, in addition to having the right and obligation to open and operate a number of locations in a designated area, also has the right (and sometimes- obligation) to recruit other franchisees. In effect, the master franchisee becomes sort of a franchisor to those franchisees who join the system through its master franchise.